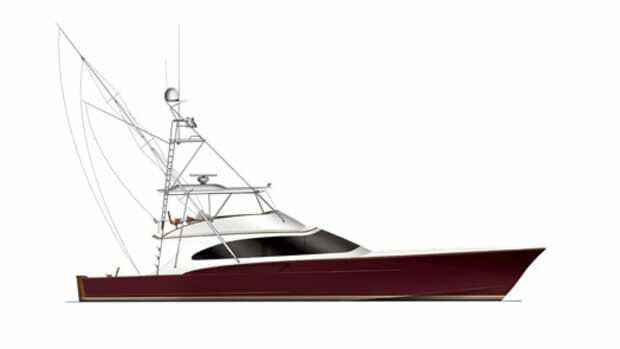 A retro-looking sportfisherman is the latest stunner in the builder’s line of custom yachts. 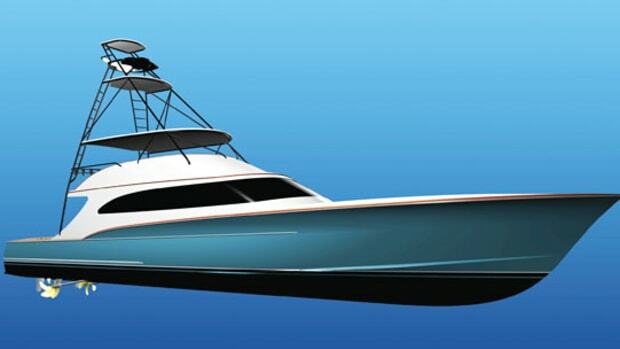 The builder&apos;s 63rd custom yacht blends classic and modern styling, with 7 feet of headroom to boot. 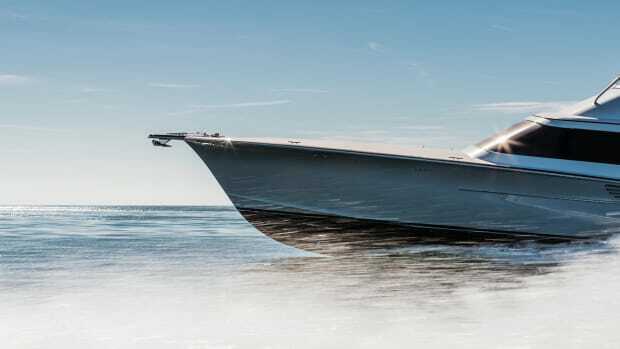 In the daylight, the new Jarrett Bay 67 Sport Yacht looks like it could have idled out of the 1920s and cruised right into 2019. 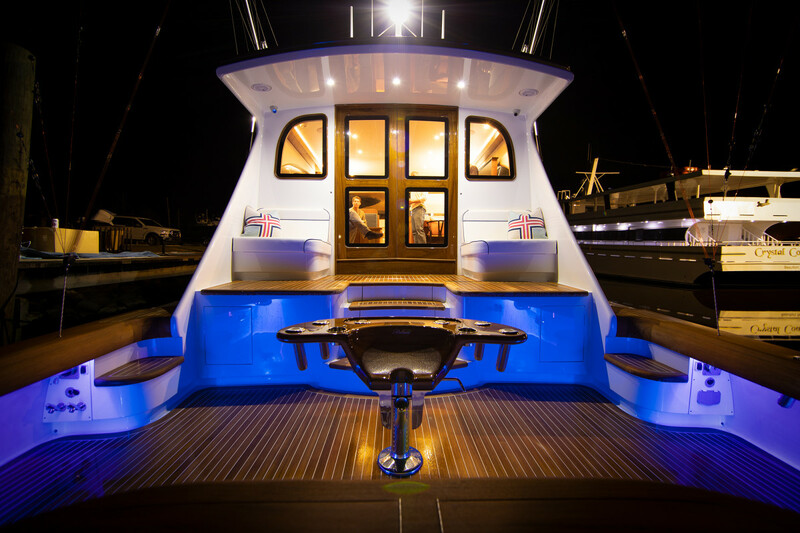 By night, the blue lights under the gunwales tell a different story of modernity. This Great Gatsby-meets-Ocean Reef Club creation is the Privateer, Jarrett Bay’s latest custom vessel that launched in March. 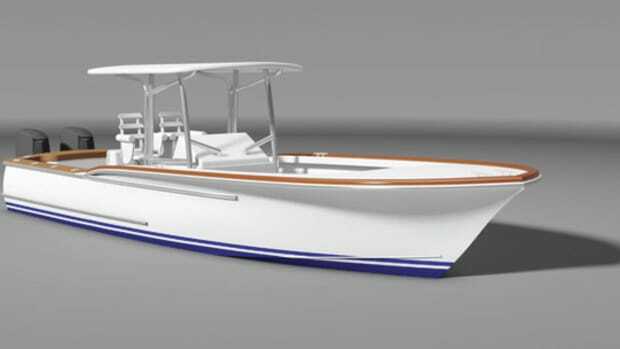 When the prospective owner first approached the builder with a concept for a retro-modern yacht, Project Manager Nile Mitchell says the team got right to work. With NBA-like height, the owner required plenty of headroom, and the 67 delivers with 6 feet, 9 inches of space in the salon and at the helm. 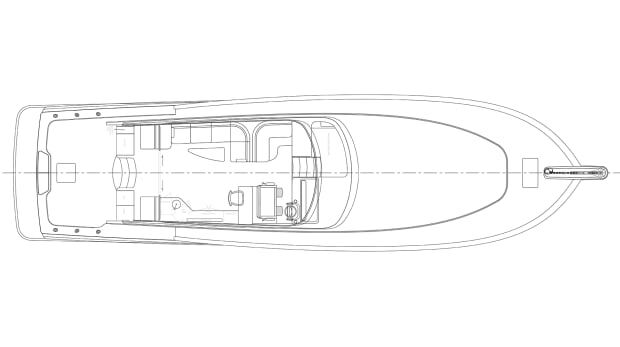 The trunk cabin allows for 7 feet, 4 inches of headroom belowdecks, letting in plenty of natural light and giving the yacht a feeling of exceptional spaciousness. That airy feeling extends to the galley, where the chef can be part of the conversation with folks in the salon or at the helm. 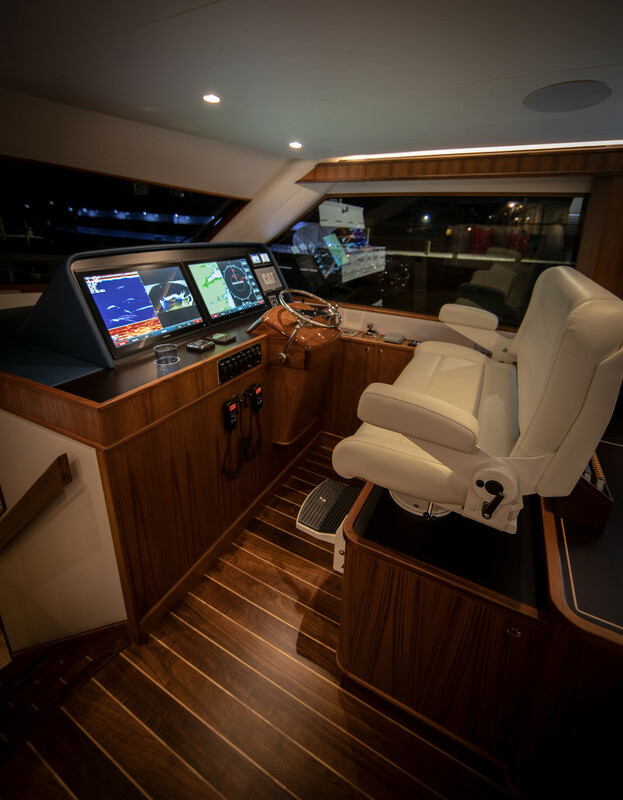 The builder’s 63rd custom model is equipped with outriggers and a fighting chair fit for a king in the cockpit. 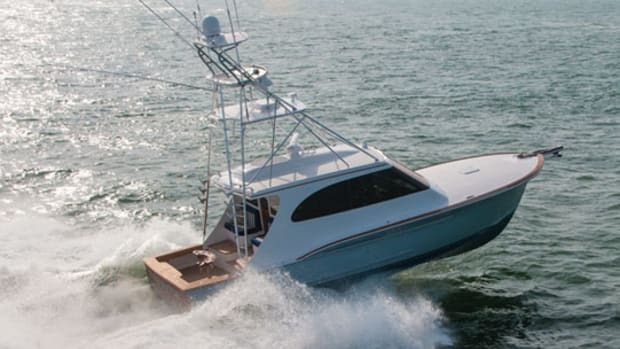 “It’s still got the Jarrett Bay flair of our custom sportfishing fleet,” says Mitchell. But the owner’s family wanted to do more than just fish, so the builder included two racks for 14-foot paddle boards and an integrated swim platform. The 67’s master stateroom is forward, with an en suite equipped with a full shower tall enough for the owner. Another cabin amidships has two twin beds, and a single bunk to port offers natural light courtesy of the trunk cabin design. Hand-selected teak above decks carries below as an accent to the maple flooring. Four-inch-wide planking gives the interior a modern touch, and the red and blue color palette offer a timeless nautical feel. The classic look continues outside with the painted teak browband, red bootstripe and green bottom paint. It took nearly three years to build the 67. The stations and stringers were laid upside-down so the hull faced up. After installing the planking and glassing the hull, the chine spray rail was added and the tumblehome bumper was installed and glassed. The whole thing was primed before the big flip, which happened nine months into construction. Once the hull was upright, the bulkheads were installed and glassed. When it came time to install furniture and fittings, the builder opted to use glue and clamps wherever possible. 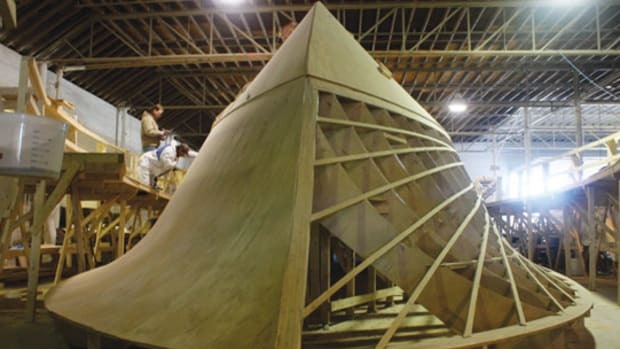 In the final months before the launch, the entire hull was hand-sanded to eliminate even the tiniest irregularities in the finish. 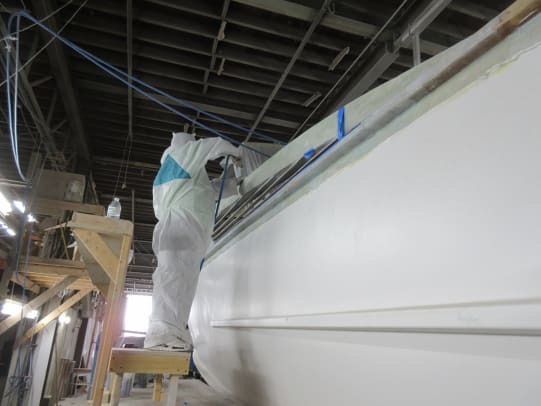 The boat was launched to measure the exact waterline, then brought back on shore to paint the bootstripe and bottom paint in their precise locations. It launched in earnest at the Palm Beach boat show. 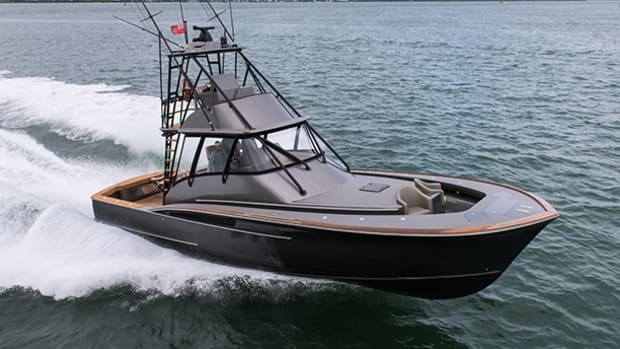 Powered by twin 1,136-hp Cat C18 diesels, the Privateer is expected to cruise at 26.5 knots for a range of 450 miles. 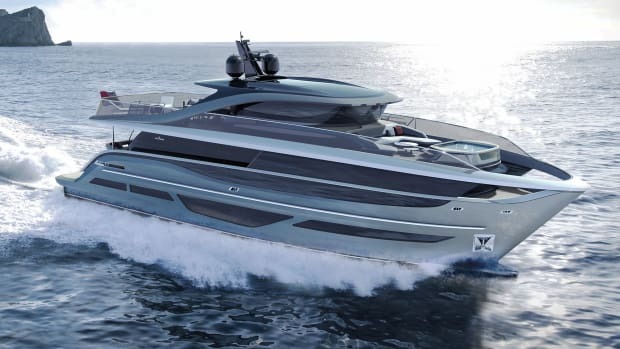 It will hit 32 knots wide open, according to the builder, but Mitchell says the owner was more interested in the fuel burn-to-mileage ratio than pushing the throttles all the way down. 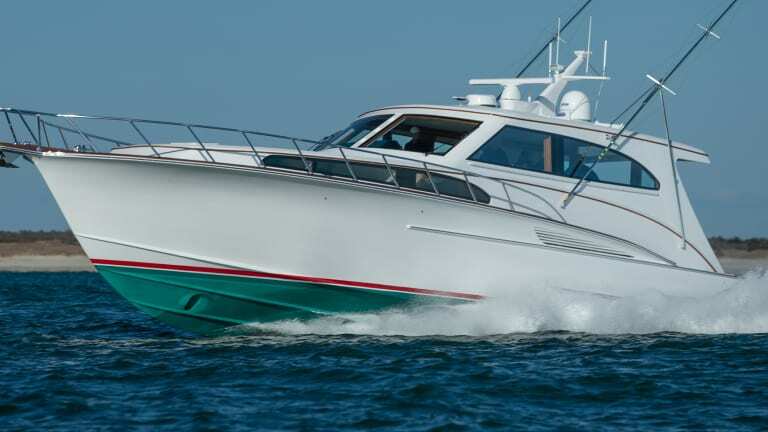 A comfortable cruise seems fitting for this waterborne beauty, which will make her home in the Bahamas and occasionally return to her roots in North Carolina. Mitchell says the final product exceeded the owner’s expectations. “He was totally amazed,” he says. 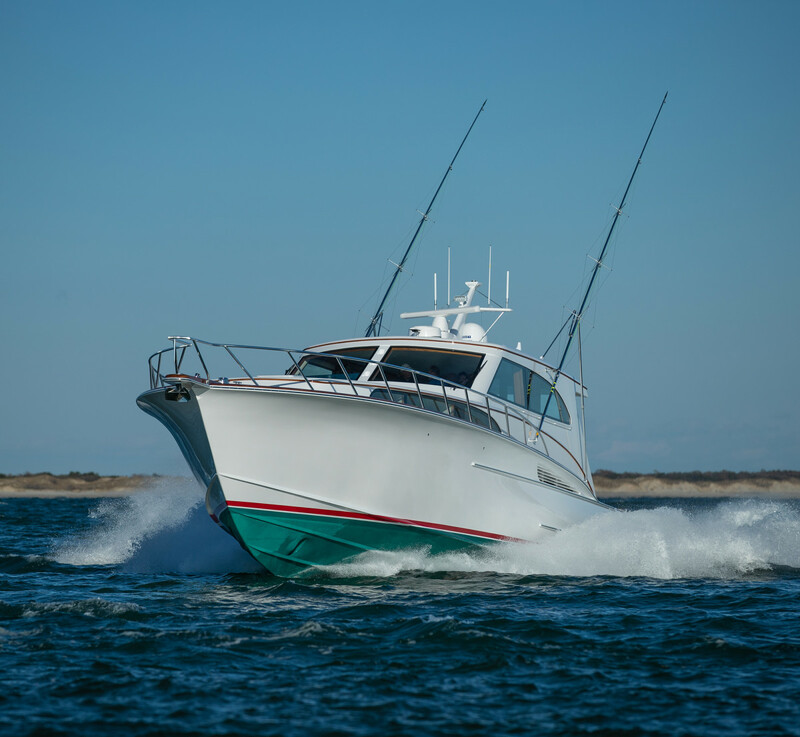 At press time, Jarrett Bay had four custom sportfishermen in build, three of which had owners. 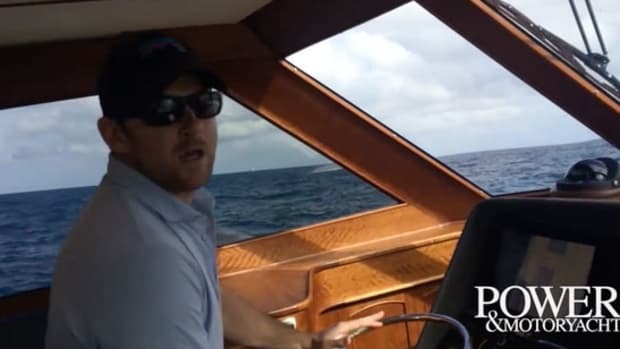 Mitchell says the team would consider building another retro-inspired yacht, but there are no plans yet; for now, the idea is a distant green light.